If you’ve been feeling like the 2016 election never really ended, the new season of House Of Cards probably isn’t for you. That’s because, in the reality of the show, the 2016 election hasn’t ended. 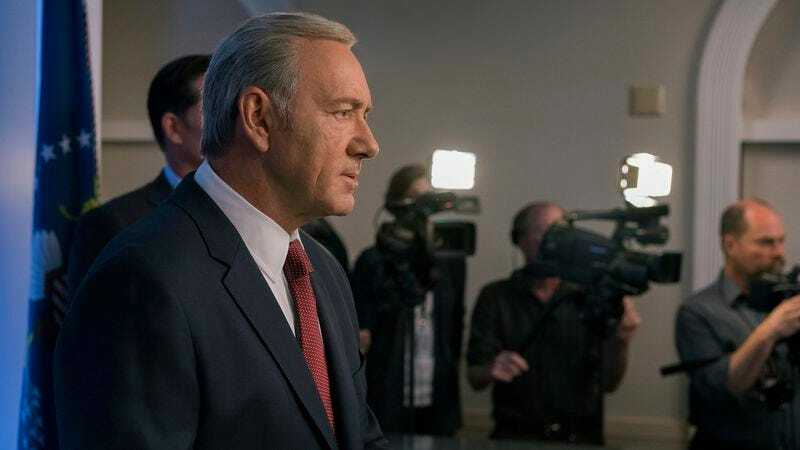 The fifth season picks up right where the fourth left off, with Frank and Claire Underwood now united as running mates, fighting off both the Republican challenger Will Conway (Joel Kinnaman) and the revelations in a damaging article by Tom Hammerschmidt (Boris McGiver). The Underwoods’ world may not have changed, but ours certainly has, so we might as well address the elephant in the room right off the bat. Since House Of Cards last aired, we have a new president and find ourselves in the realm where truth is stranger than fiction. Frank Underwood is not Donald Trump, just as he was not Barack Obama through the show’s first four seasons. 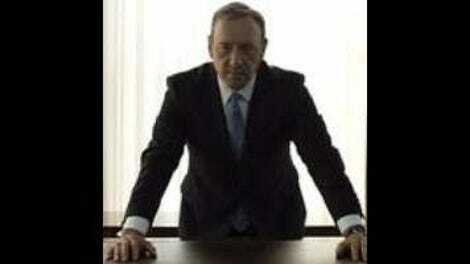 House Of Cards is a work of fiction, but it does not exist in a vacuum. The show may not have changed (although the showrunner has), but the prism through which we view it has been substantially altered since the events of last November. Watching ego-driven politicians ruthlessly accumulate power, manipulate their constituencies, make shady alliances, and plot and scheme to defeat their enemies…well, none of that really qualifies as escapism anymore. Again, Underwood is not Trump: he’s smart and competent and silver-tongued, and he’s playing five-dimensional chess while Trump is still struggling to master Crazy Eights. In his view of politics as a means of consolidating personal power with little regard to ideology, however, Frank has more in common with Trump than he’d ever admit. “Chapter 53” begins with Claire Underwood addressing the camera directly, a fake-out suggesting that the point-of-view has shifted, or is now at least shared between Claire and Frank. (Recall Claire seeming to notice us, the viewers, for the first time in the fourth season finale.) Instead she’s doing damage control, taping a message about terrorism two weeks before the election in an effort to change the subject from the Hammerschmidt revelations. Frank is doing the same, crashing a congressional session and demanding an authorization of war against ICO in retaliation for the home-grown terrorists’ murder of Jim Miller, an innocent husband and father. It’s a transparent ploy and everyone knows it, but it’s one that has been used many times in our country’s history and will be again. There’s nothing like accusing your political opponents of being soft on terror when you’re trying to divert attention from your own failings. “Chapter 53” is mostly a series of conversations in which the people in power work over the people who can help advance their cause. Conway pressures a war committee member to steer the focus away from a declaration and back toward the allegations of Underwood crimes. Frank tries to woo the surviving members of the Miller family, but they blame him for allowing Jim’s murder to happen. In the end, the Underwoods embrace the tactics of fear and the image of the president as a Big Daddy who will keep us safe, and as we’ve seen recently, that can be a winning strategy. When Frank shakes hands with his constituents through the White House gate and assures them (and us) they have nothing to be afraid of, it’s hard not to think of another self-styled authoritarian announcing “I alone can fix it.” Are you not entertained? Here’s the coverage schedule for the rest of the season: I’ll post my review of episodes two and three on Friday, then continue with dual-episode reviews on Mondays and Wednesdays until we run out of show. I’m not sure if I’m supposed to be able to parse exactly what’s going on with Leann and the hacker who breaks into the NSA server and finds all the pictures of waterfalls that mark “zero days,” or if that’s something to be further explained later. I’m hoping for the latter, since my grasp is tenuous at best. When Claire cries at Jim Miller’s funeral, Frank is pleased and prevents her from putting on her sunglasses. Claire notes that it may have been good for Frank, but not so much for her. When he tells her that Miller’s daughter wished him dead so that Claire would be president, she has no visible reaction. But she’s only a heartbeat away, as they say. I’d forgotten all about Pollyhop. I guess it’s not just a search engine, but also a social network? Or is it a discarded storyline from Silicon Valley?